St. John of Beverley is the Parish Church of Scarrington, a small, rural, village in Nottinghamshire, and is part of the Cranmer Group of parishes, which includes Scarrington, Orston, Whatton, Hawksworth, Aslockton and Thoroton. The services at the churches within the group range from traditional to more relaxed, family friendly services. They are supported by both traditional and contemporary forms of music. We aim to continue to grow our church community consistent with the leadership of our Bishop Paul William’s initiative of “Growing disciples: Wider, Younger, Deeper”. Although the Benefice is currently in Interregnum, we are maintaining the diversity of services we have, and are being supported by fabulous Clergy and Readers. You can be assured of a warm and friendly welcome. Any queries should be directed to our administrator Donna Johnson on 07526 603 766 or our Church Warden Phil Morris 01949 850182. The Church does not have regular Sunday Services but special well supported, family friendly, services are held throughout the year at Christmas, Easter and for Harvest Festivals, the dates of which are published on this website and advertised on the Church noticeboard. Scarrington, with a population of less than 200, has a fairly even mix of retired, working and young people. There are sixty five houses, three working farms and two livery yards. Although Scarrington does not have a pub, shop or village school, but there is a daily bus service, and a local W.I. hall that hosts lively village events, local clubs, and meetings. The village also boasts a unique heritage landmark, a pile of horse shoes that stands over 17 feet high! St. John of Beverley is a grade one listed 13th century Church in a conservation area which is in good condition and benefits from a new organ, and sound system, providing facilities for music when an organist is not available. It has a steeple tower with three original bells dated 1450. In 2002, after a fund raising campaign, the medieval bell frame was replaced and a new 1650 bell was added, then a smaller treble bell, and finally a specifically cast bell generously gifted by the Southwell Diocesan Guild of Bell Ringers. There are no records as to when the church was built, and there is no mention of it in the Domesday Book, but from the nailhead carvings on two pillars, and the wooden carving over the organ, it is thought to be 13th or 14th Century. Anciently Scarrington was a chapelry of Orston and remained so until 1867 when it was detached, together with Aslockton, from Whatton, and the two together formed a new ecclesiastical parish; as had been recommended for Scarrington 217 years earlier by the Parliamentary Commissioners! However, in 1910 Aslockton returned to Whatton, and Scarrington was put with Hawksworth. The Church of St. John of Beverley was repaired and partly rebuilt at the beginning of the 19th century at a cost of £300. In 1866 it was described as consisting of tower and spire, nave and chancel only, the south aisle having been removed and the south arcade walled up with bricks in 1802. There was no chancel arch and the roof had a ceiling. In 1867 the church was enlarged, the south aisle replaced, new windows inserted, the ceiling removed, the roofs re-tiled, and the old pews replaced. The tower and spire were rebuilt in 1790, and then repaired in 1896 at a cost of £500. The roofs were again re-tiled in 1956, and the tower repaired again in 1960. Under the tower is a restoration Font dated about 1662. The design on the bowl is similar to that In Sibthorpe (1662), and Southwell Minster (1661), the latter being made by William Balme of Mansfield. The original Font, now in the South East corner, was reputed to have been lost after having been thrown out by Cromwell's troops; it was recovered in 1900 after having been used as a pump trough for many years! Scarrington’s three original bells all date from about 1450 - a rare instance of a complete ring surviving together in the same tower from medieval times. Two of the bells seem to have been founded in York, and one of these carries the badge of the Kempe family (Cardinal John Kempe was Archbishop of York in 1450). It is not known why these bells should be installed in Scarrington, or whether there was a connection with the Kempes. But the bells remind us that when they were first hung, Scarrington, with all England’s churches, owed allegiance to Rome. They carry Latin inscriptions in adoration of the Virgin, such as: ‘Sancta Maria ora pro nobis’ and ‘Ave Maria’, worked in an unusual large ‘black letter’ medieval style. Ironically, they must have been heard, not long after they were first hung, by the man who would sever England’s link with Rome at the order of Henry VIII. Thomas Cranmer, future Archbishop of Canterbury and martyr, was born only a mile away in Aslockton in 1489. Scarrington suffered from the religious turmoil of the sixteenth century - a record of 1559 shows the benefice as void and the churches ‘books burnt’. The church gave sanctuary to a Royalist soldier who hid in the tower during the Civil War in 1645. By 1800 the building was derelict, but was rebuilt and was further renovated in 1867 (when the bell frame was probably refurbished). Wear and tear took their toll, and the bells and their frame became unusable during the twentieth century. It is thought that, prior to the restoration, the bells had probably not been rung full-circle since the coronation of King George VI in 1937. Although there was no space for a fourth in the tower before restoration, from their tuning, it is surmised they may be the front three from an original diatonic peal of four. The wooden frame (now preserved above the new installation) has original medieval timbers, and may have been cut down from a larger frame before being installed in Scarrington. The frame was overhauled in the nineteenth century, and various constituent timbers replaced. Additional headcills were fitted so that new brass bearings could be fitted into sound timberwork. 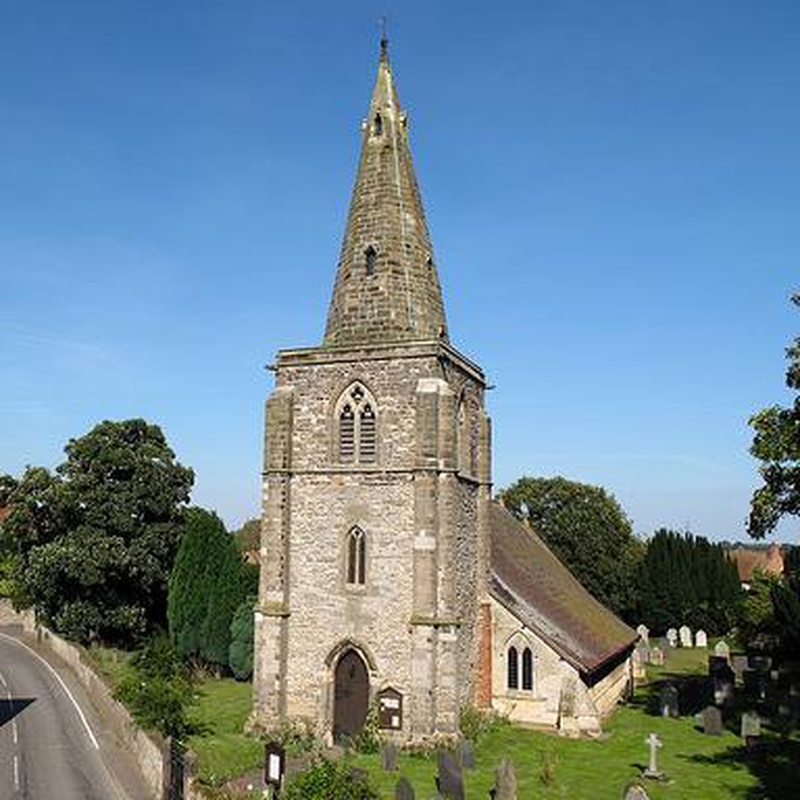 At the end of the Twentieth Century it was decided by the people of Scarrington to raise money to restore the ancient bells of the Parish Church of St John of Beverley and add a fourth bell to augment the ring. The addition of this bell as the new tenor was made possible by a generous donation from Mr James & Mrs Judith Mackness. The bell was slightly tuned by Messrs Taylor of Loughborough before being hung in Scarrington’s tower, to make it compatible with the existing three. It has the effect of transposing the original ring into a major key. In April 2002, following extensive work, the bells had been returned to the tower, and masonry work was complete. Bell Ringers and visiting teams are always welcome at Scarrington, should you wish to arrange a visit please contact the Church Warden.